In EV mode plug-in hybrid vehicles are more efficient than some electric cars. The trend towards plug-in hybrids is steadily growing. With so many new types of vehicles on the road, Torque News took a look at which are rated most efficient by EPA estimates. This article was inspired by research done on the selection of a green vehicle for the Torque News “What I would buy” series organized by Patrick Rall, Editor of Torque News. During the research it became apparent that not all electric cars have the same efficiency, that Plug-in-hybrids (PIH) can have better efficiency in some cases, and that size and shape of the vehicle is not really a good predictor of the car’s overall efficiency. First we must define efficiency. Rather than recreate the wheel we will use the EPA’s definition. EPA realized that it needed to use some form of measurement to allow shoppers to determine how efficient an electric vehicle is. 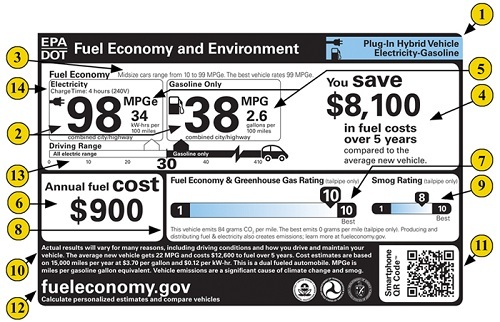 The efficiency model is selected was “miles per gallon equivalent.” Regardless of how the EPA defined efficiency there would be those that disliked the choice. MPGe has the benefit of being easily understood by shoppers used to miles per gallon. As an engineer, I have no preference for units. I would be just as happy with coulombs per furlong, as long as the values are accurately measured, and are consistent. In order to understand how plug-in hybrid vehicles work it is important to first realize there is not just one type. There are really two. The first, are those that are designed to primarily be used as electric vehicles. The Chevy Volt defines this category and it really is the only one selling at this point. The second type of plug-in hybrid car is a car that is a hybrid, meaning it usually uses the gas engine, but augments that with electric drive. What makes the plug-in variants different is that they can hold enough electric charge in their batteries to get you to the shopping mall, get you to work (maybe), and allow you to do most of your weekend activities using only electric power. The Toyota Prius PIH, Honda Accord PIH, and many others are examples of this type of drive. In contrast to these vehicles that offer some electric drive are the pure electric vehicles. These are cars that can only use electric drive. There is no gas engine on board. The Nissan Leaf and the Tesla Model S are the best examples of these types of cars. At this point we should stop and recognize that these are very, very rare automobiles. In a new car market like the US, which sees over 13 million new vehicles sold per year on average, there have only been about 30,000 of these cars in total sold to customers per year over the past few years. Before that there weren’t any models of any significant number being sold. Contrast this with the Ford F-150 which sells about 650,000 units each year and it gives you some perspective. However, green car advocates say that the electric car is about to explode in popularity and they are likely correct. If they are not correct, it won’t be gas powered cars that keep them from being popular, it will be the plug-in hybrids and hybrids, which are now selling in much larger numbers. Hybrid technology is now so ubiquitous that some cars, and car makers have simply stopped mentioning it. Chevrolet and GM started this trend. They have been applying hybrid technology to many models and they don’t use the term hybrid at all. At the other end of the market, BMW now applies many hybrid derived technologies such as auto stop-start to almost all of its models. The best example of a hybrid technology that is now 100% adopted is electric steering. There will be no more hydraulic steering vehicles to come. Now that we have looked closely at the offered groups of cars, let’s compare some cars and see how they do against one another. For our comparison we will rely upon FuelEconomy.gov and the manufacturer’s information, but only if the EPA information was actual, not projected. Also, it makes sense to balance the manufacturer’s information with another source since it can be sometimes a little deceiving. They tend to highlight their best mileage in the model range in their marketing information, and then provide the worst (but fastest, and longest range models) for testing to the car magazines and other automotive journalists. Let’s first compare the Honda Accord PIH to its stable-mate, the all-electric Honda Fit EV. When driven as an electric car, for the 13 or so miles it can travel on its batteries, the Accord has an EPA estimated 115 MPGe. The car is a large, comfortable five passenger vehicle, with a large trunk. The Honda Fit EV by comparison is smaller, but still claims five passenger room and has a hatch-back design, so storage is possible as long as you don’t mind passers-by to see the items in the car (think laptop and purse). The Fit has an EPA estimated 118 MPGe. What happened? Why isn’t the Fit dramatically more fuel efficient? Let’s now compare the Honda Accord PIH to the all-electric Tesla Model S. In this comparison we must choose which Model S to compare because there are multiple versions. We will select the most energy efficient model listed by fueleconomy.gov which has a 60 kw-hr battery pack. The Tesla has an energy efficiency score of 95 MPGe. These two cars could not be more alike. Both are 5 passenger sedans and have similar dimensions, though the Tesla is notably larger in width. Why would the Tesla score so much lower than the Accord? One clue is the battery capacity. The Tesla with the larger battery scores even lower on the MPGe scale at 89 MPGe. So we know that a change to the drive system can obviously change the efficiency. Aerodynamics and weight also play a role. Clearly at this point the case can be made that the plug-in hybrids are coming on strong. The Prius PIH with a score of 95, the Chevy Volt with a score of 98 and the Nissan Leaf with a score of 99 MPGe are very close comparisons. Fans of electric only drive will cry foul and point out, correctly, that many PIH vehicles will burn significant amounts of gas. While that is true today, since the PIH vehicles (Volt aside) only go about 10 or 15 miles on electric drive, all batteries are progressing, slowly, but surely. It will not be long before the technology allows for a low cost PIH system to be applied to a more or less conventional car that will propel it 20 miles on electricity only. At that point it will start to become very difficult to claim an EV is more energy efficient in actual daily operation. Perhaps we will even see 20 mile EV ranges on cars such as Mustang GTs and Camaro SS muscle cars. Well thought out, John. I might argue with you over how you've defined the plug-ins, but it doesn't change your overall point, so it's not really relevant. This is a very odd article. Saying some Plug in hybrids are more efficient in EV mode then some EV's is exactly the same as saying "some EV's are more efficient then other EV's" Its true but it doesn't really mean anything. Rob, Thank you very much for pointing this out. For clarification, I will say plainly that the Accord PIH can be operated 23% more energy efficiently than the all-electric Tesla. I think to many green car advocates that will be great news, but disturbing. This is because the take-home price of the Accord is under $30K in many states and the Tesla, well one should budget at least $50K to $100K depending on taste. Also, it highlights that EVs are not the greenest cars in America - maybe. Our readers have made it quite clear in their comments that they don't consider Plug-in Hybrids "Real electric cars." That they can be operated more cleanly than all-electric cars might be a surprise to those readers. I appreciate your comments. Please keep them coming. Yes, and the 60kwh Tesla can be operated more efficiently then the 85kwh model S. The accord is shorter, significantly narrower with less then half the luggage space. The reality is that the model S is a BIG sedan and that has efficiency downsides, the mid size gen 3 Tesla will be substantially more efficient. Comparing one particular hybrid with a much larger EV and declaring hybrids are more efficient is meaningless. The Accord is also more efficient than the Leaf when it is operated as an EV. Perhaps someday shoppers will start to consider the comparative efficiency of cars with electric drive options. Perhaps not. Hey dummy. The Model S is 1000 lbs heavier than the Accord and has over 2x the horsepower. And you conclude the sloth is more efficient than the bobcat. Great logic there Sherlock. How come the bigger, heavier, more powerful Accord is more efficient than the Nissan Leaf Watson? I think key point is how much you drive. Furthermore, this article barely considers the relative cost of EV vs PIH (everyone brings up the Tesla at $100k but this is an aluminum intensive luxury sports car... not fair to compare to a boring sedan like the accord or volt). When you exceed the 20 mile range of the PIH, you are burning a lot more gas than a subcompact or 'traditional' hybrid (and PIH carry a premium over these cars). A pure EV (though you are completely limited by electric range) provide sustained efficiency for longer distance. It may sound counter intuative to the general public but a pure EV is actually better if you regularly drive a 'long' distance (ex 50 mile round trip or 100 mile round trip if workplace charging is available). Of course you'll also need a second car for the rare trip beyond 100 miles... but I think the fact that EV advocates have noticed is that this model fits better with the actual current market in the US. Few people have 1 car that they only use 20mile a day and spend $40~50k (is the accord really $30k?? that's over 10k less than a volt??? I think accord is more like $40k vs a leaf which is $28k). Good insight. If you regularly drive a "Long" distance to work are you living green? Starting MSRP on the Accord is $39,780. The article notes that after the federal and state rebates the price is under $30K. Perhaps that is not correct, but I'm pretty sure it is. That price includes Nav and a lot of the newest safety gadgets like forward collission warning, lane departure, etc and also all the typical luxury items a luxury hybrid comes with. Here is an interesting fact, the Accord PIH gets 46 mpg combined (47 city, 46 highway) when it is operated as a gas (only) powered car. So actually, it would be more fuel efficient than every subcompact in the US market and a very competitive hybrid. For example, it is more fuel efficient than the Camry hybrid and the Malibu Eco. It gets 124 mpge city when operated as an EV. It uses regular unleaded too. That saves owners 10% on fuel costs vs premium. John, the point is each car you mention is designed for a specific market. It's well known that the leaf makes compramises in order to make ev's affordable. By contrast, a tesla makes no compramises, it's the best an ev can do in luxury and performance (though the objective isn't so much efficiency... It doesn't need to be since the electric drivetrain itself puts it in the 'green' class). Pih's are more expensive inherently due to paying for 2 powerplants; i didnt realize the accord did so well in milage (i dont believe the volt does) but purchase price alone isnt enough to judge. honda is known for bringing products to market at a loss and then abanduning them when they dont take off (think the last accord). efficiency and cost in engineering terms need to be viewed in apples to apples terms, your article claims inharent efficiency of pih vs pure ev, however you merely making observations of the relative skill and marketing policies of ech company rather than a pure technology evaluation. There will be a day when shoppers will be rating ev's on relative efficiency but today we merely have 1 (or maybe in some areas 2) cars to pick from in a given 'class'. Yeah and being truely green we'd all walk or ride bikes to work... Come on we shouldn't be against each other, picking pure ev vs pih is no different than picking 4 cylinder turbo vs v6, v6 vs diesel, sure each could be tuned or designed differently but by in large they're efficiency is defined by how they are used. It does the green movement no good for people to get the wrong car for their needs. We recently bought the Honda PIH and leased a Leaf. I usually get 16 miles pure EV with the Honda. My commute is about 17 miles. With the family, this drops to 14 miles. If they were adults, it would likely drop to 12 miles. In the past five weeks, I have driven 2000 miles and used about 20 gallons of fuel. My first 700 miles involved two highway trips where I averaged about 60 mpg. The last 1300 miles have been at 130 mpg. The car charges in 38 minutes on a 220 unit, about 3 hours on 120. There is a learning curve to the Honda as there are different modes to drive in. Our electric bill for 1600 miles of monthly driving is about $55 in San Diego. For the fuel, I have used about 6 gallons a month for the Honda. The Honda is a classier car, a true sedan for the family. The Leaf is great for mid range trips when you want to be pure electric. Most trips are less than 60 miles round trip so the 85 mile range works very well for us. In some ways it is a little more fun to drive the leaf for short trips as you don't feel like you need drive lightly to stay electric. The Honda will switch to Hybrid mode at higher speeds and with faster acceleration. It is actually fairly smart about how it does it. Even using a trickle charge, my wife only charges it every second day. I charge my Honda every day both at home and at work (trickle for now mostly) but do use the plug in spots. Overall very happy with our choices. We have the flexibility of using fuel, pure electric, having a small car and a sedan. We leased the Leaf and bought the Honda. The tax and rebate benefits of the two totaled about $8000. The lease payments for three years on the Leaf are about 10K so you get the point. You can cite the theory of the Tesla's efficiency, but it still is not as efficient as the Honda when both are operating on electric drive. Some of the facts in the article include the EPA mpge of the cars discussed, the range of the Accord in EV mode and also in total, battery pack capacity of the Tesla, the correct number of the cars sold per year, and some other misc facts. What were you looking for that was missing in terms of facts? The Honda's gas engine weighs less than the added battery capacity of the Tesla. So, which car is lugging more drivetrain than they need? True that electric motors are more energy efficient than gas motors. That is why the Honda has added one. The Tesla Model S has a Cd of 0.24, the current Mercedes-Benz CLA has 0.23 and the 9th-generation (2013) Accord upon which this plug-in hybrid will be based is 0.27 and though no numbers have been released for the PIH, it will have better Cd because of its added belly and wheel covers and improved hoodline - probably 0.26. The total vehicle weight of the Accord PIH (which is based on the highest-end Accord Touring, btw) is 3,799 pounds. Almost a full thousand pounds lighter than the Model S in its lightest configuration. So your complaints about "zero facts" and the answers to your questions don't help your attempt at demeaning this article. Frankly, you're clueless, Anonymous. I would ask a question? Do we not need to get to a 100 percent electric powered car in order to achieve the "green" energy goal? I can imagine only one way to achieve that which is a return to the place we were 100 years ago with the trolley car technology. That change would require some serious R and D to make a modern,safe, and efficient electrical power transfer mechanism (trolley). I envision special high speed (trolley) lanes of traffic where electric cars could travel very fast and very close together with computer adjusted spacing and sequencing into and out of that specialized high speed lane of traffic. That basic formula might be a possible option for R an D which could make real and substantial progress toward truly green transportation? The trolley would be a way to recharge the battery power needed to get you from your house to the ( trolley/ commuter) lanes.